Before learning how to cook pork chops it is wise to learn a little about the large selection which you have to choose from. 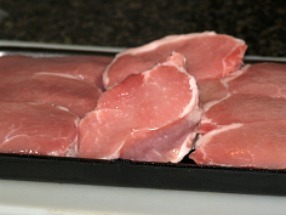 Pork chops can be purchased in many thicknesses and are cut from different areas of the pig. A pork chop or we might say “chop of pork” a rib or part of the vertebra in the individual serving. This meat is suitable for frying, grilling outside, placing under the broiler and baking in the oven. In the market this cut of pork might be labeled simply “pork chops”, center cut pork chops, sirloin cut pork chops, rib chops, blade or should chops and various areas might have other names for specific cuts of chops. When learning how to cook pork chops knowing these different types will help in your cooking. The center cut is comparable to the beef T-bone steak and is more expensive than other cuts. Cuts which have more of the connective tissues included making them a little tough in part like the blade chops are less expensive. You can purchase pork chops with the bone in or boneless. Again, getting an idea of which you prefer when learning how to cook pork chops will help you in your selection. Although I do like the flavor of good “bone-in” chops, I often choose the boneless cuts. If I am cooking for guests, I always choose the boneless; they are just much easier for people to eat not having to struggle with the bone. Pork chops come in several thicknesses. 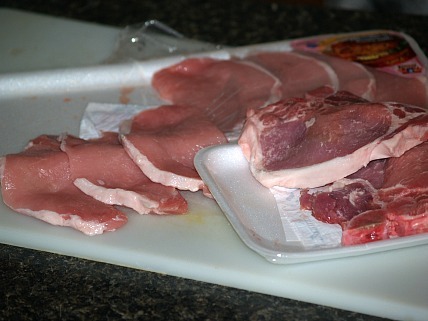 When learning how to cook pork chops, it helps to have an idea as to which thickness to use for various recipes. For a simple family meal, ones which are cut one half inch thickness are great and fast to fry. On the other hand, if I am going to stuff the chops I want them to be about 1 ½ inches of thickness. This size gives me room to slice them through the middle so I can add the stuffing. Also when stuffing I always choose the boneless chops. 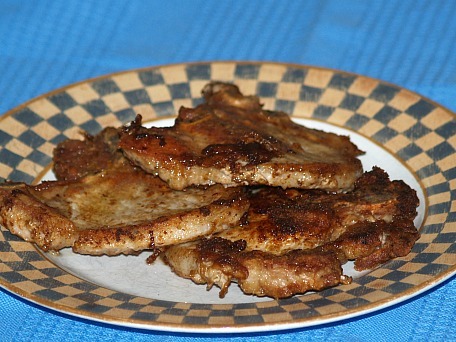 Frying pork chops is the most common way of cooking this cut and is the fastest. By varying the ingredients you use, especially spices, can make them taste differently each time you cook them. 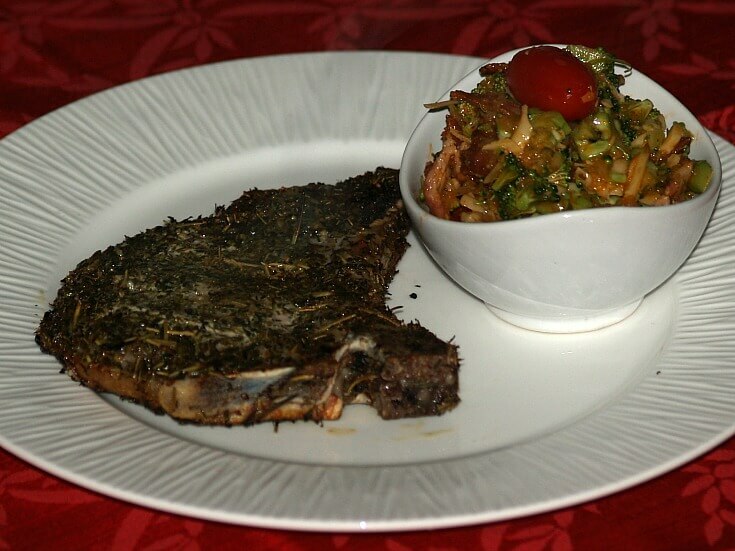 The recipe below is a little special when learning how to cook pork chops. Combine flour and Parmesan cheese in a large plastic bag; add salt, dill and pepper. Place pork chops in the bag and shake to coat; shake off excess flour in the bag and reserve. Heat the oil in a large skillet over medium heat; brown chops on both sides. NOTE: If needed move browned chops to platter until all have been browned. Return chops to skillet; reduce heat. Place onion on top of chops; add water, cover and simmer for 15 minutes. Place zucchini slices over the onion; sprinkle remaining Parmesan flour mixture over the top. Sprinkle with paprika; cover and simmer for 25 minutes or until chops are very tender. This baked recipe makes a great meal-in-one when learning how to cook pork chops. Place carrots, rutabaga, parsnip, turnip and salt in a medium saucepan. Place drained vegetables in a 2 quart casserole dish. Heat the oil in a large skillet; add chops and cook 5 minutes on each side. 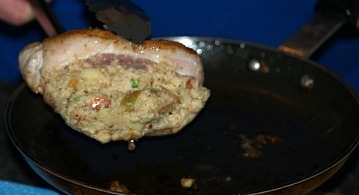 Remove chops from skillet and set aside; add onion to the skillet and cook until softened. 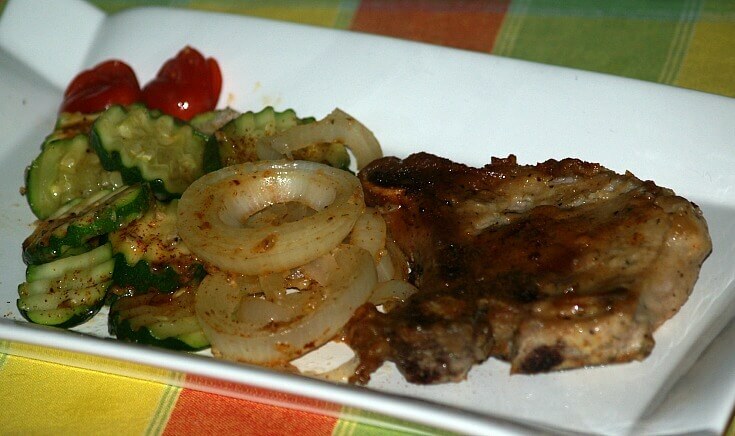 Spoon onion over the vegetables in the casserole; lay chops on top of vegetables. Sprinkle top of chops with salt and pepper; pour reserved liquid over top of chops. Layer potato slices over top of the chops; brush with drippings from the skillet. NOTE: At this point you could cover and refrigerate overnight or freeze up to 1 month. 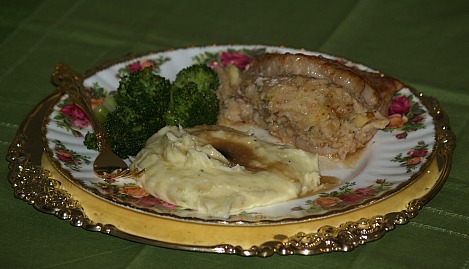 Bake in oven at 325F degrees for 1 to 1 ½ hours or until pork and potatoes are tender. Combine thyme, oregano, rosemary, basil, lemon pepper and salt; rub on both sides of meat. Cook 4 to 6 minutes on each side; meat thermometer should read 160F degrees in thickest part. Learn how to cook pork chops with lots of flavor. Combine tomatoes with next eight ingredients in a blender; puree until smooth. 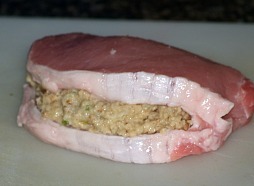 Place chops in single layer in baking dish; pour pureed mixture over the chops. Cover dish and place in refrigerator overnight or up to 2 days turning chops over twice daily. 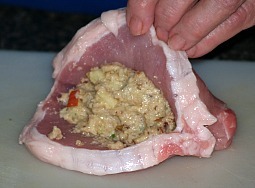 Remove chops from mixture and reserve marinade. Grill or broil pork chops 7 minutes. Turn chops over and brush with puree marinade until done. Serves 8. Bring remaining pureed marinade to a boil; boil for 2 minutes and serve with chops. Learn how to cook pork chops with mushroom stuffing or apple stuffing. 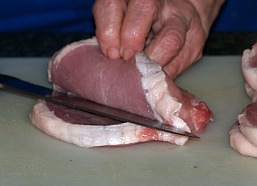 Trim excess fat from chops; sprinkle meat with a little salt and pepper. 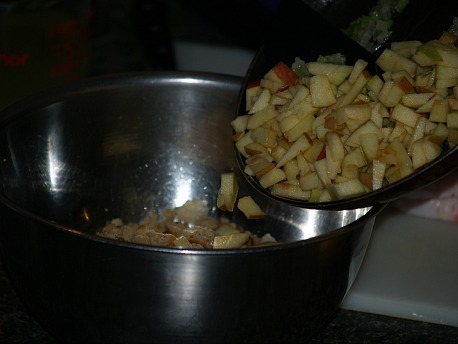 Cut pocket in side of each chop; prepare favorite stuffing. Combine mushrooms, parsley, onion, salt and pepper in a bowl. Divide diced cheese among the pockets of the pork chops. Finishing stuffing pockets with the mushroom mixture; reserve any leftover mix for sauce. Dip chops in egg and then in bread crumbs; slowly brown chops in skillet with hot oil. Add 1 cup of water and wine; cover and simmer about 1 hour or until tender. Place meat on platter and keep warm. To make SAUCE blend cornstarch with 3 tablespoons cold water; stir into wine mixture in skillet. Cook and stir until thickened and bubbly; stir in any mushroom mixture left. Melt butter in skillet; sautee onion and celery until tender. Combine skillet mixture with bread, apple, eggs, sage, salt and pepper. Slowly brown chops on both sides in hot oil; place in single layer in baking pan. Add about 1 cup of water, cover top and bake about 1 hour at 350F degrees or until tender. This is how to cook pork chops with a delicious orange sauce. 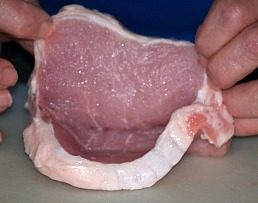 Trim several pieces of fat from sides of pork chops. Heat fat until lightly browned in a large skillet over medium heat; rub fat over bottom of skillet. Salt and pepper pork chops; cook over high heat until browned on both sides. Add salt, pepper, paprika and water to skillet; bring to a boil. Reduce heat under skillet to low, cover and simmer about 15 minutes turning over one time. Prepare orange sauce; grate 1 tablespoon orange peel from stem side of orange. From other end or orange cut 6 thin slices; set aside. (My orange were large so I cut the slices in half). Combine in saucepan orange peel, juice, sugar, cornstarch, cinnamon and cloves. Add ¼ teaspoon salt; cook and stir over medium heat until thickened. Add orange slices and cover; remove from heat. 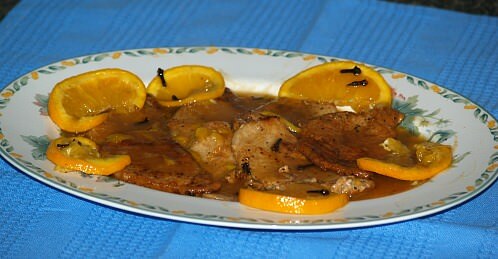 Top pork chops with orange sauce to serve. 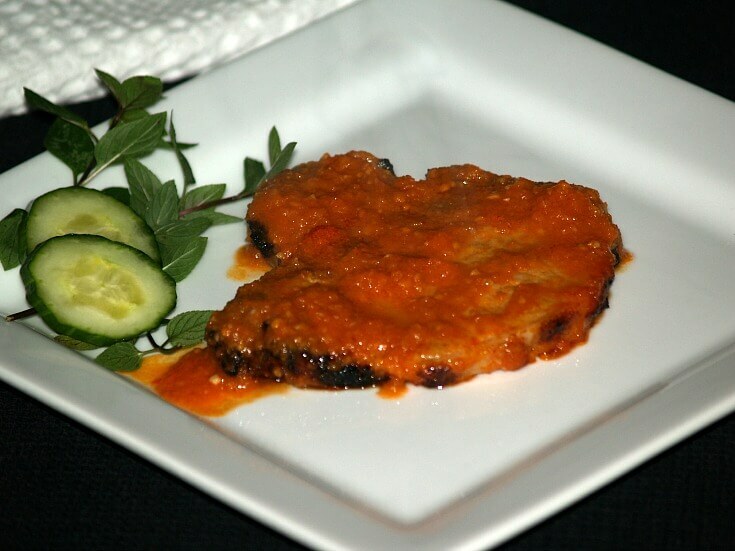 Learn how to cook pork chops with a tasty puree! Rub pork chops with Cajun spice; brown on both sides in hot oil in large skillet. Remove chops from skillet; reserve chop drippings in skillet. Add onion and minced garlic to skillet; cook until tender. Return pork chops to the skillet; add broth, jelly and vinegar to skillet. Cover skillet and simmer 10 to 15 minutes until chops are tender. 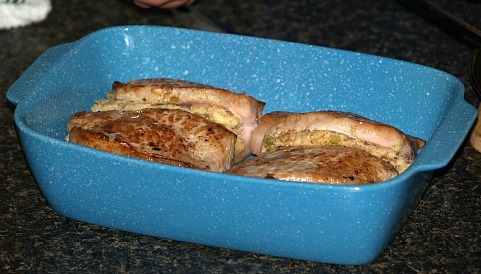 Transfer pork chops to warm platter and keep warm. TO MAKE PUREE combine garlic and remaining 4 ingredients in food processor. Process mixture until smooth stopping to scrape down sides. Pour mixture into heavy saucepan; cook and stir over low heat until hot. Serve with pork chops; serves 2. Heat oil in large skillet; add garlic and cook until lightly browned. Season chops with mixture of salt and pepper. Brown chops in skillet on both sides; add mushrooms and peppers. Combine tomatoes and wine; pour into skillet. Cover skillet and simmer over low about 1 to 1 ½ hours until chops are tender. NOTE: Add a small amount of water if needed (If dry); serves 6. Learn how to cook pork chops with gravy. Combine first 4 ingredients in shallow dish. Dredge pork chops in flour mixture; set aside. Combine the REMAINING flour mixture with broth in slow cooker. Pour oil in large skillet; heat over medium high heat until hot. Cook chops in skillet just until browned on both sides. Place chops in slow cooker; cover and cook on high 2 to 2 ½ hours until tender. Serve with mashed potatoes or cooked rice; serves 6.